Plzenska Restaurant in Prague is a premium Czech restaurant situated inside one of Europe's finest Art Nouveau buildings, the stunning Municipal House. Plzenska, named after the famous Czech beer, Pilsner Urquell, offers traditional Czech cuisine, prepared and presented with style, in a classic beer hall setting. As this is Municipal House, the interior of the restaurant is exquisite, with magnificent Art Nouveau features from the days of the First Republic, including ceramic mosaics, a golden clock and beautifully restored furniture by Sadílek. The decorative windows are all original. For a true taste of hearty Czech fare, Plzenska is the perfect restaurant because of the range of dishes on offer. Food choices include golden roasted duck, spicy grilled ribs, beef goulash with baked sausage and onions, leg of lamb, roast pork, local fish and more. Typical red cabbage and dumplings are amongst the sides. And leave space at the end for a nice home-made blueberry cake or apple strudel! The Czech wines are reasonably priced, but we highly recommend ordering an ice-cold glass of Pilsner Urquell beer to accompany your meal, in traditional Czech fashion. Because Plzenska is a large popular restaurant and they get through a lot of beer, you are sure to receive a fresh beer from a pretty fresh barrel every time. A live accordion or double act, 'Duo Švejk', complete the atmosphere, providing entertainment every night. The high ceiling and beer hall setting carry the music well. Plzenska Restaurant is located just a few minutes walk from both Wenceslas Square and the Old Town Square. For well presented, tasty Czech fare in the heart of the city, and in a stunning building, Plzenska Restaurant takes some beating. 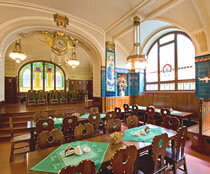 For fine dining in the same building, Municipal House also contains Francouzska Restaurant. Plzenska Restaurant is an ideal restaurant for groups, because the food, service, ambience and entertainment is all good. And there is plenty of space, so tables can be arranged as required. Advance reservations are essential.